Sometimes our writing is really on the rocks! It seems like it’s going nowhere, everything is shaky. You’re writing, but your mind is thinking of a thousand other things you need to do, or worse, you’d actually rather do. It’s part of the process. Doubt creeps in. I’m not making money doing this. Who really cares? Will this lead to anything, ever? Who knows? But like all endeavors, you won’t know until you put the time in. Most of what we write probably won’t be some earth-shattering epiphany for others or ourselves. Write anyway. If the process satisfies your soul, by all means keep going. Somewhere deep down, in every group of rocks, a diamond in the rough is hidden. Somewhere in your story, your account of the facts, or your telling of fiction lays a nugget that will connect deeply to another soul. Maybe it is just to entertain someone or make them laugh, but you will connect. Trust your heart and keep writing. Because as I am learning, the more we write on the rocks, the deeper our roots can find way to solid ground. Write even though your work and family life takes first priority—write later, or write less, but find time to write some! Write even though your personal life is busy, chaotic, uncertain, boring, or in flux. Write even though you don’t know the outcome. Write because it’s the therapy that heals your soul. Write because it anchors you to your truest self, the side of you that has to create. Write as you await revelation. Create something because you already know the creation of you was a miracle. Who knows the future? But like a seed planted among the rocks, you may be the rare one who not only grows, but thrives on the rocks. Your best work may happen here. 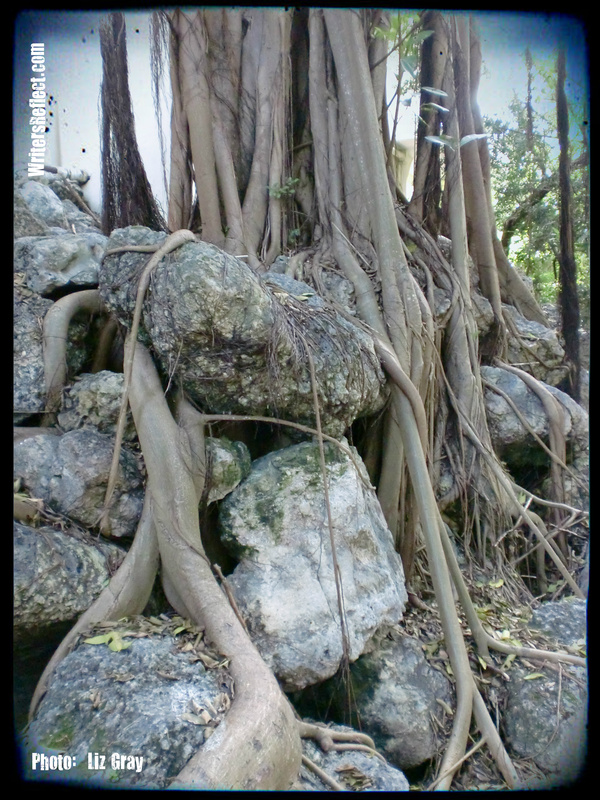 When it does, you will someday look back and see below the tallness of the tree, lie deep roots that not only hold the rocks together, but anchor deeply to a living water that nourishes it and firm earth that anchors it. You insecurities may make you feel shaken, not stirred. Write anyway; you already know you’ve got something to say even if right now your life or words are on the rocks. Wow! How much I needed this one. Very reassuring, well worded and accurate. I agree wholeheartedly and would encourage all bloggers to persevere … It’s a great community, even though sometimes the distance between us means we do not always get the hand on the shoulder reassurance we sometimes seek. Thank you so much for your encouragement beeseeker! You’re write (ha! )–it’s a very supportive community and yet writing is more a solitary experience than about anything you ever do. More real than an imaginary friend sometimes! My favorite things about writers? Their quirkiness and interesting perspectives! Cheers to the brave souls who dare to air their quirks!